A current focus of our corporate development is on after-sales service and repairs that ensure efficient propulsion performance at sea. 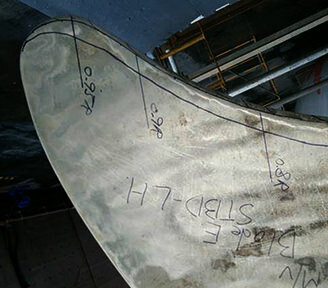 We also consult with clients about propeller replacement and the propulsion performance of energy-saving devices as a ship's operating conditions change, and we can propose the most suitable solutions for a particular application. A wide variety of fixed-pitch propellers are the major products of Nakashima Propeller. Vessels with these Nakashima propulsion systems are operating all over the world. To ensure safe operation of the vessels, we have worldwide service network. Our service agencies are located in major areas of China, Singapore, Turkey, UK, USA and Brazil. Nakashima has a capability to carry out propeller repairs not only under dry dock condition but also afloat and underwater. There are some cases where vessel operations are unable to be suspended for service work. In such case, our engineers including diver engineers carry out temporary repairs afloat or underwater to minimize her non-operating hours. 1% improved efficiency can equal a cost saving of 340,000US$ per year for a mega-container vessel. In recent years, low-speed operation (low-power mode) has become typical for container ships. Therefore, the propeller may typically operate in a different engine power range from the engine output planned at the time the ship was built. We are committed to replacing propellers for ships that have been redesigned to operate in the low-power mode to improve fuel efficiency. 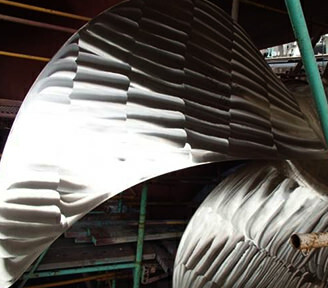 In response to requests from ship owners, we are replacing propellers with retrofits optimised for low-power operation. 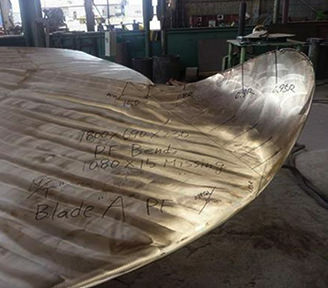 Depending on the design horsepower, the efficiency of the retrofit propeller can gain an improvement of up to 5%. If the efficiency of a mega container ship can be improved by even 1%, the fuel efficiency can be reduced by about 340,000 US dollars annually, which is a great advantage. As fuel costs increase, we have also proposed energy-saving devices to existing vessels. We offer energy-saving devices to meet the needs of our ship owner clients, such as ultimate rudder bulbs, which are highly effective in reducing fuel consumption, or eco-caps that are very easy to install.